Almost everything about the Stur brand is unique. 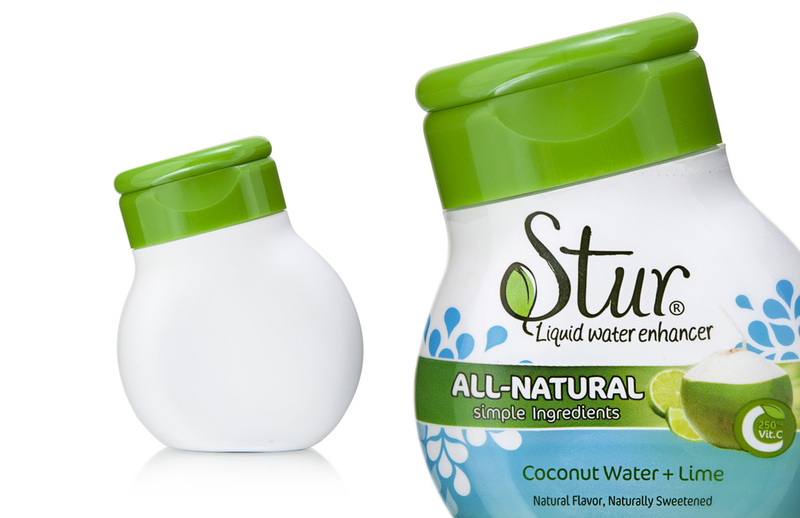 As the leading all-natural liquid water enhancer, Stur’s products are made from only the best natural fruit and stevia extracts, and they don’t contain any artificial flavors, colors or sweeteners. A family owned company borne out of a father's desire to provide his wife and children a flavorful way to drink more water (the name "Stur" stands for "Savor The Ultimate Reason"! ), Stur is a labor of love. In order to speak to the brand’s purity theme and fruit-extract origins, the Studio developed a unique package that is overtly fruit inspired. We mirrored the canted orientation of the Stur logotype and leaf device, balancing a valved dispensing closure at a tilt. Overcoming the processing challenges of an off-center neck was well worth the extra engineering efforts, as the result is a package that stands out immediately from a field of competitors in the crowded water enhancer space.